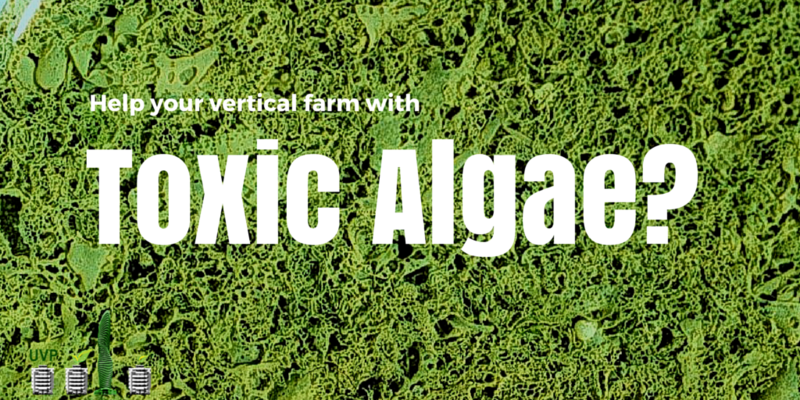 Can toxic algae help your vertical farm? This short vertical farming thought piece is just a taste of what’s going on in vertical farming. To get down to the details you’ll need to make your project a success, join our newsletter here! Blue-green algae produces a sickening toxin that forced Toledo’s public drinking-water system to shut down. How on Earth can this help vertical farmers? A few months ago we wrote about fixing fertilizer runoff in the Great Lakes region, and in the nation as a whole. Vertical farms could play a huge role in doing that – not only do they minimize synthetic agricultural inputs, but many strive to create a closed loop system where each input is maximized and nothing is left to waste (or to stream into the nation’s drinking water). So, how does this actually help vertical farmers or the industry as a whole? Well, let’s face it; there are a lot of problems with conventional agriculture. Each new thing that vertical farming can do better makes it more competitive as compared to outdoor agriculture, especially as scrutiny on conventional farming increases in light of pressing environmental concerns like climate change or feeding a population of 9 billion. • It overuses antibiotics, resulting in dangers to the public from antibiotic-resistant diseases. About four-fifths of antibiotics sold in the United Statesare for livestock and poultry — even as 23,000 people die annually in America from antibiotic resistant infections, according to the Centers for Disease Control and Prevention. • Farming overuses chemicals such as pesticides, some of them endocrine-disruptors that have been linked to possible cancer, obesity and reproductive disorders. • Factory farming is often based on treating animals, particularly poultry,with ruthless cruelty. To this indictment, we can add irrational subsidies and water engineering projects that have led to irrigation in areas where it doesn’t make sense. Today, California, despite the drought, is effectively exporting water (in the form of milk, beef, walnuts and produce). While it’s true that every vertical farm is different, and some could be just as environmentally damaging, the potential to make this a truly sustainable industry is there. Even hydroponic farmers who aren’t using a closed loop system can recycle their water and the nutrients in it. However, instead of draining it away, many growers use it to water gardens or outdoor crops and there are numerous people working towards monitoring systems that would allow growers to only add to their solutions what the plants are taking out. While growers watering non-CEA crops is an efficient use of resources, the meticulous monitoring inherent in CEA and vertical farms is where this technology really has an opportunity for impacting the problem of fertilizer runoff. CLEVELAND, Ohio – Early forecasts are calling for a smaller-than-normal toxic algae bloom on Lake Erie this summer than those that defiled the lake in seven of the past eight years. Researchers at the National Oceanic and Atmospheric Administration, which released the projection today, said a relatively dry spring produced lower amounts of runoff from farms discharging phosphorus into the Maumee River and western basin of Lake Erie. You can read more here, but that pretty much sums it up. There is less toxic algae growth. At first, that’s great news. But when you really think about it, why are we still struggling with a system that causes toxic plants to grow where people drink water? What are some other ways vertical farms can contribute to reducing fertilizer runoff? Do you agree that they are becoming more competitive as environmental concerns continue to grow? This entry was posted in Hydroponic, news, sustainable agriculture, technology and tagged hydroponics, sustainability, water pollution by Evan. Bookmark the permalink.